This page is about the city in Knox County. For the neighborhood in Columbus, Ohio, see Mount Vernon, Columbus, Ohio. 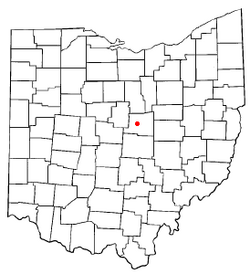 Motto: "One of Ohio's Most Likable Communities"
Mount Vernon is a city in Knox County, Ohio, United States. The population was 16,990 at the 2010 census. It is the county seat of Knox County. On January 1959 a severe flood caused 500 homes to be evacuated and caused $5 million in damage. In August 2006, an F0 tornado touched down on the west side of town. It demolished a barn at the local 84 Lumber, and the resulting debris blew across the road to the DeCosky GM car dealership. It caused at least $150,000 of damage. 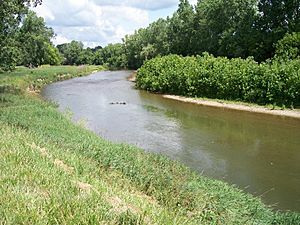 The Kokosing River in Mount Vernon in 2006. Mount Vernon is located at (40.392738, −82.481151). According to the United States Census Bureau, the city has a total area of 9.60 square miles (24.86 km2), of which 9.41 square miles (24.37 km2) is land and 0.19 square miles (0.49 km2) is water. The city lies in the Glaciated Allegheny Plateau and is surrounded by rolling hills and valleys. The Kokosing River and U.S. Route 36 pass through the city. As of the census of 2010, there were 16,990 people, 7,110 households, and 4,016 families residing in the city. 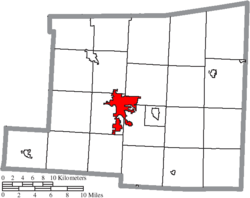 The population density was 1,805.5 inhabitants per square mile (697.1/km2). There were 7,836 housing units at an average density of 832.7 per square mile (321.5/km2). The racial makeup of the city was 95.3% White, 1.1% African American, 0.2% Native American, 1.1% Asian, 0.7% from other races, and 1.5% from two or more races. Hispanic or Latino of any race were 1.8% of the population. There were 7,110 households of which 28.3% had children under the age of 18 living with them, 38.4% were married couples living together, 13.6% had a female householder with no husband present, 4.4% had a male householder with no wife present, and 43.5% were non-families. 38.0% of all households were made up of individuals and 16.5% had someone living alone who was 65 years of age or older. The average household size was 2.19 and the average family size was 2.88. The median age in the city was 37.2 years. 21.8% of residents were under the age of 18; 13.7% were between the ages of 18 and 24; 23.2% were from 25 to 44; 24% were from 45 to 64; and 17.3% were 65 years of age or older. The gender makeup of the city was 46.5% male and 53.5% female. As of the census of 2000, there were 15,256 people, 6,187 households, and 3,730 families residing in the city. The population density was 1,710.4 people per square mile (660.7/km²). There were 6,713 housing units at an average density of 798.7 per square mile (308.6/km²). The racial makeup of the city was 96.66% White, 1.15% African American, 0.31% Native American, 0.54% Asian, 0.29% from other races, and 1.04% from two or more races. Hispanic or Latino of any race were 0.87% of the population. There were 6,187 households out of which 28.0% had children under the age of 18 living with them, 43.8% were married couples living together, 12.7% had a female householder with no husband present, and 39.7% were non-families. 34.2% of all households were made up of individuals and 16.1% had someone living alone who was 65 years of age or older. The average household size was 2.25 and the average family size was 2.88. In the city the population was spread out with 23.7% under the age of 18, 10.1% from 18 to 24, 27.2% from 25 to 44, 20.7% from 45 to 64, and 18.3% who were 65 years of age or older. The median age was 37 years. For every 100 females there were 86.2 males. For every 100 females age 18 and over, there were 81.3 males. The median income for a household in the city was $29,801, and the median income for a family was $38,217. Males had a median income of $31,900 versus $21,969 for females. The per capita income for the city was $16,471. About 12.7% of families and 15.6% of the population were below the poverty line, including 20.7% of those under age 18 and 9.2% of those age 65 or over. Buildings along East High Street in downtown Mount Vernon. 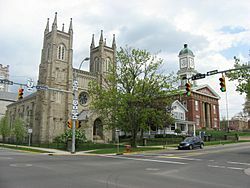 In the foreground is St. Paul's Episcopal Church, and the Knox County Courthouse is visible behind. Mount Vernon, Ohio Facts for Kids. Kiddle Encyclopedia.